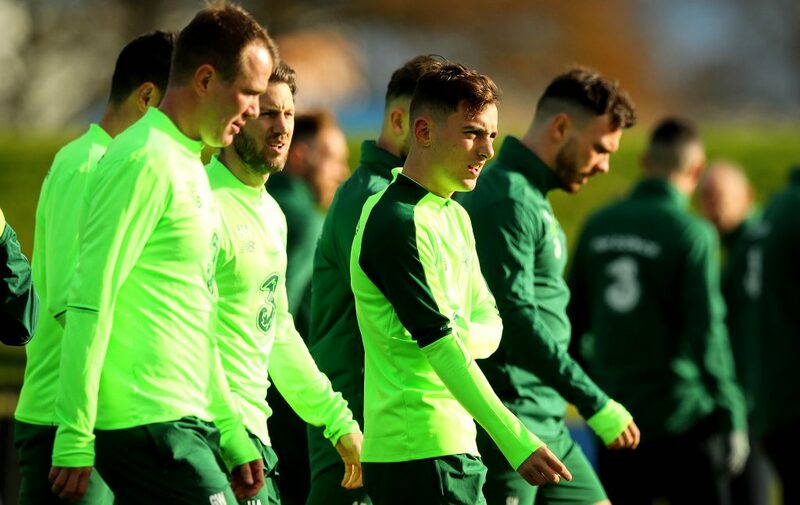 Lee O’Connor at Republic of Ireland Squad Training at the FAI National Training Centre in Dublin this week. Photo: Ryan Byrne/Inpho. Waterford’s Lee O’Connor has been added to the Republic of Ireland squad for their UEFA Nations League game away to Denmark on Monday. The former Villa FC man, who is now with Manchester United, is the captain of the Ireland U-19 team and was this week called in to train with the senior squad by Martin O’Neill this week and having impressed the manager he has now been called into the full squad for the first time. Defender John Egan (calf), midfielder Alan Browne (shoulder), and forward Sean Maguire (hamstring) all miss out, while both Glenn Whelan and James McClean are also out after featuring in the scoreless draw with Northern Ireland. Former Under-21 international Jimmy Dunne has been drafted into the senior squad for the first time. The defender, who is on loan at Hearts from Burnley, will link up with the Ireland players on Saturday ahead of their departure to Aarhus.